When we first visited Turkey in April 2014, I was in awe of the beauty of both the landscape and its people. One of my favourite places in Turkey was Istanbul. Istanbul is the cultural and financial hub of Turkey and has an estimated population between 12 and 19 million people, which is why people are often surprised to find out that it is not Turkey’s capital city. The vast city located on both sides of the Bosphorus, the narrow straight between the Black Sea and the Sea of Marmara. On the west of the Bosphorus, Istanbul sits in Europe, but on the east side of the Bosphorus it sits in Asia. It is often thought of as the bridge between the east and the west, both physically and culturally. There are statues and monuments to Mustafa Kemal Atatürk everywhere. Atatürk was a military officer during World War I. He led the Turkish National Movement in the Turkish War of Independence and defeated the forces sent by the Allies in 1915. Atatürk then embarked upon a program of political, economic, and cultural reforms, seeking to transform the former Ottoman Empire into a modern, democratic nation-state. Under his leadership, primary education was made free and compulsory and women were given equal civil and political rights. The Turkish people are humble, lovely and welcoming, while the shopkeepers are helpful and not pushy. However, some women might experience some unwarranted attention, which is annoying but harmless. The Turkish people take pride in the country and their flag. The red flag featuring the white crescent moon and first star is fondly flown on tall flag poles, from balconies and in windows everywhere. You will notice more flags on special days of celebration, such as a Children’s Day in late April. The Nazar Boncuk (Turkish Blue Eye Bead) can be found everywhere. It is a glass bead that protects the holder from evil eye. It is very common in Turkey and can be found dangling from cars, backpacks, necklaces, bracelets, pinned to clothing, or hanging above doorways. The first ezan (Islamic call to prayer) is chanted from Mosque minarets throughout the streets at dawn. It is followed by four more prayers spaced throughout the day, so that one is constantly reminded of Allah and gives opportunities to seek his guidance and forgiveness. While 98% of the country will identify themselves as Muslim, alcohol is readily available and the working week is Monday to Friday instead of the customary Muslim working week of Sunday to Thursday. The seemingly stray dogs and cats around Istanbul are tagged. The government ensures that they are well kept, wormed and well fed. Taksim Square is the heart of modern Istanbul. It is a major tourist area and known for its restaurants, shopping and hotels. It is also the main transfer point for the municipal bus system, the terminus of the M2 subway line of the Istanbul Metro, the nostalgic tram line (NT) on İstiklal Avenue to Tünel and the Fenicular (cable car) to Kabataş. Many protests and demonstrations have been held in Taksim Square over the years. The Taksim Square massacre of 1977 left 36 left-wing demonstrators dead, while two Leeds United fans were stabbed to death here during football riots in 2000. Following these terribly violent incidents, many group protests were banned. 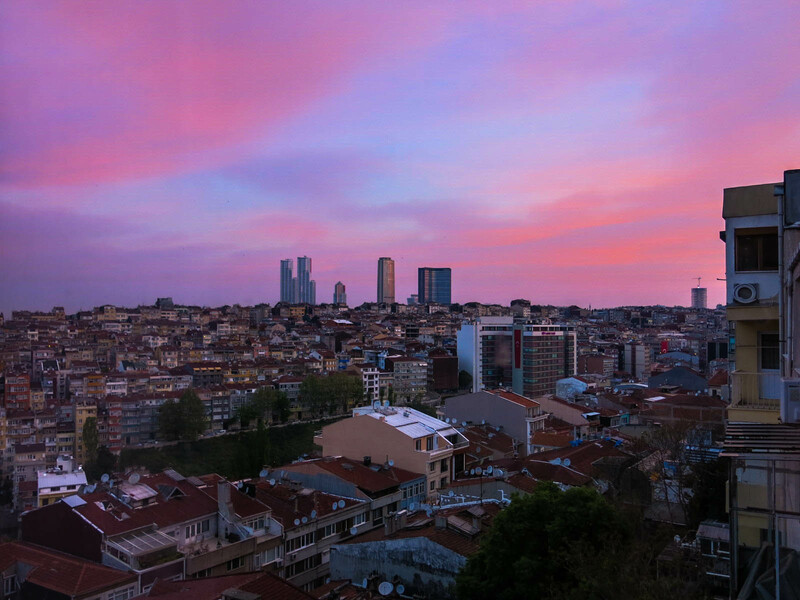 New Year’s Eve, Republic Day celebrations, the annual Istanbul Pride and mass-screenings of important football matches are excluded from the ban. 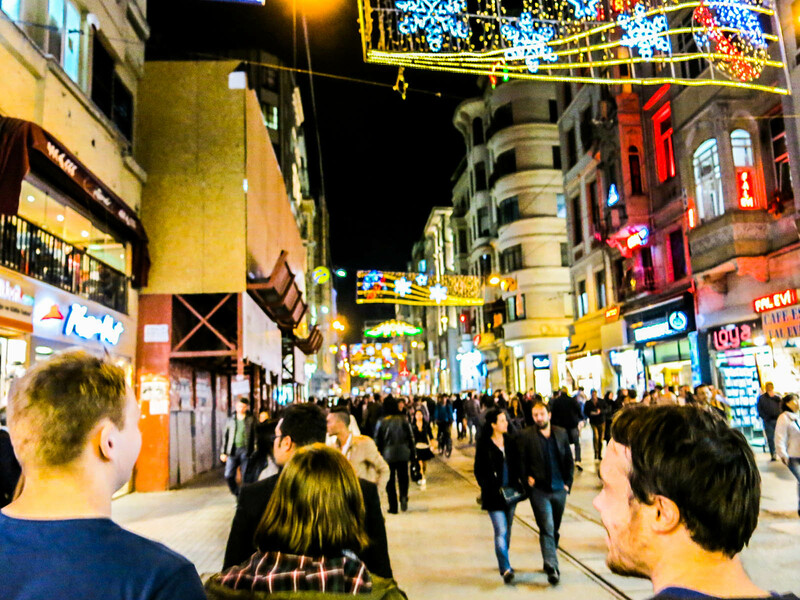 Starting in Taksim Square, İstiklal Avenue is an elegant pedestrian high street home to numerous boutiques, stores, galleries, cinemas, patisseries, cafes, pubs and night clubs. Beyond this 1.4km street is a maze of the same, surrounded by late Ottoman era buildings from the 19th and early 20th centuries. İstiklal Avenue, with its surrounding avenues and alleyways, is sometimes referred to as the Paris of the East, is the modern day center of fine arts and leisure in Istanbul. Taksim Square and İstiklal Avenue are easily linked to the Old City of Istanbul by public transport. From Taksim Square metro station, take the funicular (F1) to Kabataş station then transfer to the tram (T1) which will take you to Sultanahmet. You have to buy two tokens at the metro station (3TL each). If you travel with 2 or more a taxi may be cheaper. The Old City of Istanbul, known as Sultanahmet, is the location of some of its most historical sites. It is located on a peninsular, surrounded by the Golden Horn in the north, the Bosphorus in the east, the Sea of Marmara in the south and the old city walls in the west. This area is what used to be called Constantinople. It is easy to explore this part of Istanbul by tram, but it is even easier to discover the smaller streets and historic sites by walking. Hagia Sophia Museum (Ayasofya Muzesi in Turkish), also known as the Church of the Holy Wisdom, was a cathedral built in Constantinople during the 6thcentury AD under the direction of the Byzantine emperor Junstinian I. It was completed in 537 AD after only 6 years construction and it is now a component of a UNESCO World Heritage Site called the Historic Areas of Istanbul. The current building stands on the foundations of a pagan temple and ruins of the original church said to have been built in 325 and then rebuilt after fire in 404. 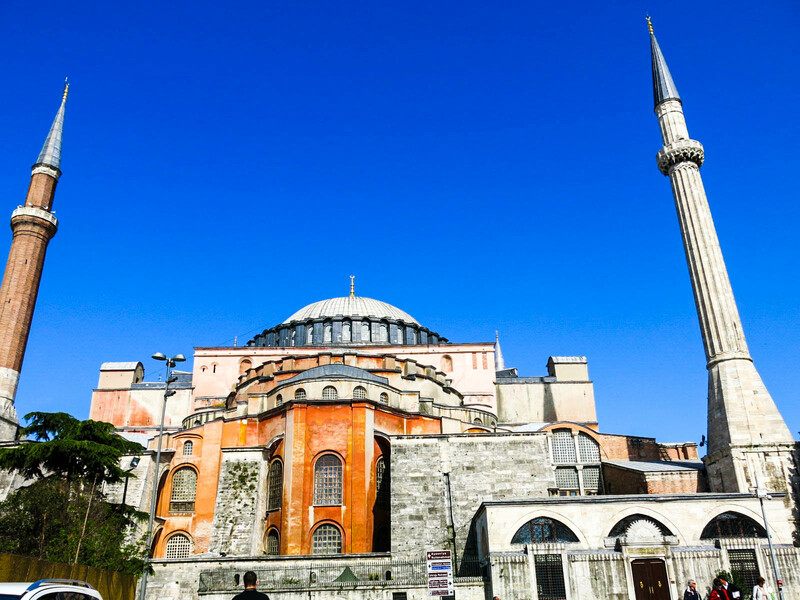 A second fire in 532 provided Justinian I an opportunity to rebuild this splendid structure with its 32 meter dome and two smaller semi-domes. Marble piers and newly renovated outside walls support the massive dome, which has partially collapsed a number of times. Sadly, you can see sections of gold mosaics and tiles missing from this magnificent and colourful building from when it was looted by the Venetians and the Crusaders in the 13th century. In 1453 it was repurposed as a mosque before being converted into the museum you see today in 1935. Just across the green Sultanahmet Park is the Blue Mosque (Sultanahmet Camii in Turkish). 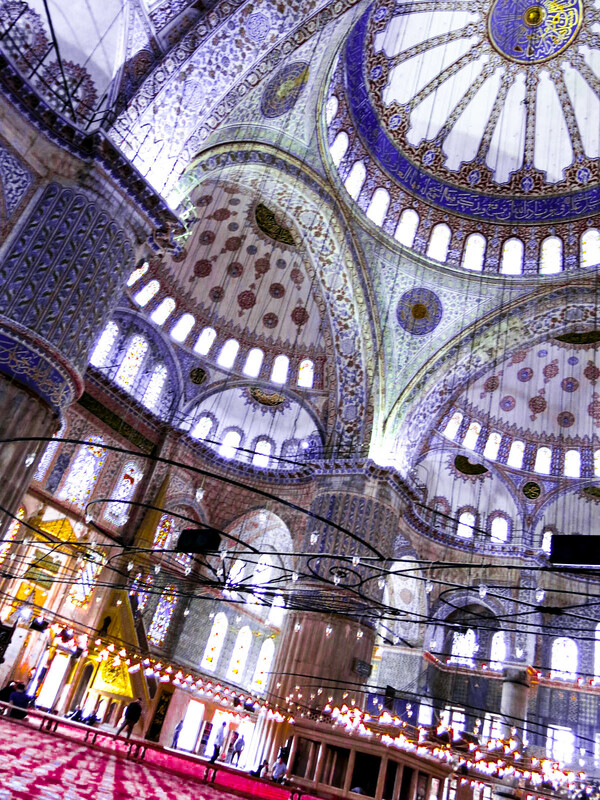 This historical mosque is known as the Blue Mosque because of blue tiles lining the interior walls. It was built during the rule of Ahmed I between 1609 and 1616. It is an example of classical Turkish architecture and it is the only mosque that was originally built with six minarets. There is a strict dress code for all visitors. Skin tight trousers, skirts and shorts above the knee will need to be covered and women must wear a head covering. Scarves and long skirts are provided free of charge. Plastic bags are provided at the entrance (free of charge) for you to carry your shoes in while you enter the Mosque. When you are inside the mosque, remain quiet and don’t use flash photography. Being a place of worship visitors should avoid staring or taking picture of those who are praying. Traveller Tip: Female head coverings: Place the fabric cover on top of your head with equal portions hanging on both sides. Take one side and wrap it around your neck, tossing it behind your back with covering your shoulders. Don’t cover your face, the covering is meant to hide your hair only. 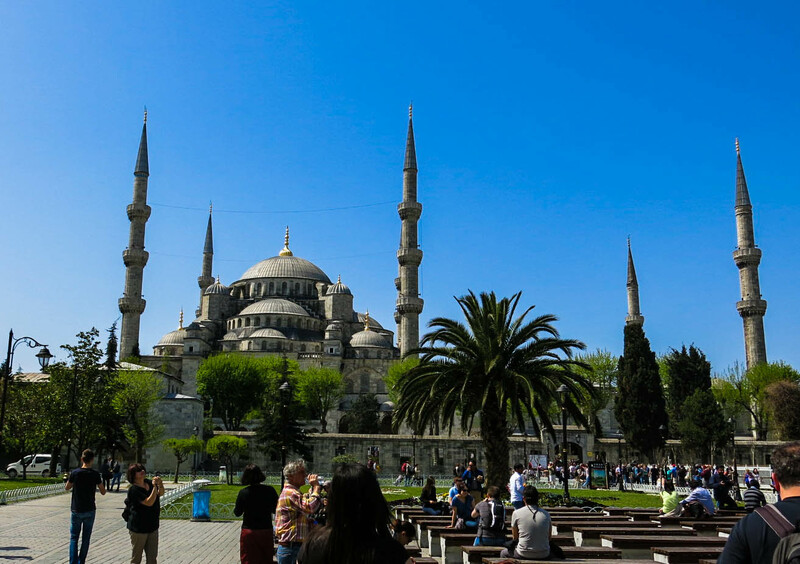 The best view of the Blue Mosque is approaching it from the Sultanahmet, or Hippodrome, to the west. 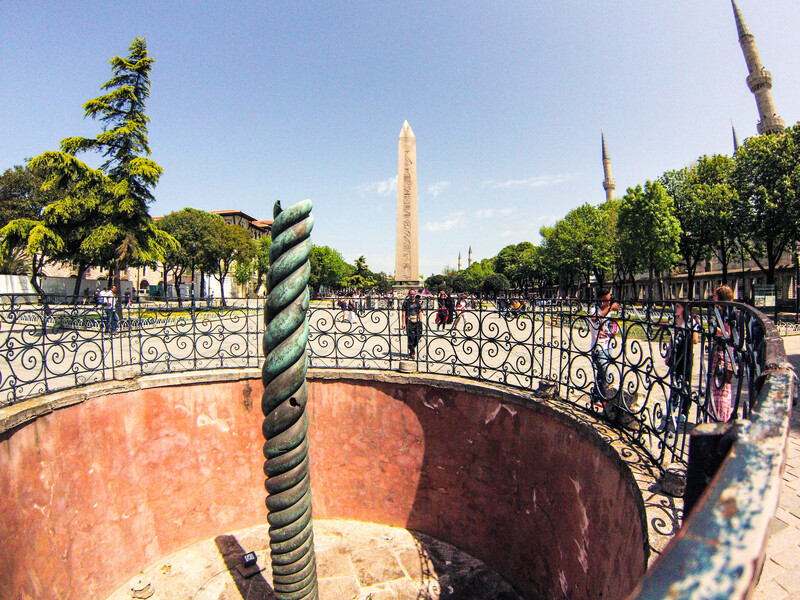 The Hippodrome is a large space adjacent to the Basilica Cistern, Blue Mosque and Hagia Sophia. It was built by Roman Emperor Septimus Severus in 203AD. The building no longer stands, but an Egyptian obelisk of Theodosius and pieces of other sculptures that have been collected here since the fourth century remain. The Serpentine Column originally stood at the Temple of Apollo in Delphi, Greece. It was erected in 479 BC as a commemoration of the Greek victory over the Persians. It was brought to Constantinople in the 4thcentury and was originally formed by three intertwining snakes before being partially looted by the Crusaders. The Basilica Cistern is a giant underground cistern built by Justinian in 532 to provide water to the city in cases of siege. A wooden walkway floats above the fish filled water and winds between the pillars. Lights and piped music add to the eerie atmosphere and the statues of Medusa are impressive. Behind the Hagia Sophia Museum are the Museum of Archeology (Arkeoloji Müzesi), and Topkapı Palace (Topkapı Sarayı). The Museum of Archeology (Arkeoloji Müzesi) contains a large collection of archaeological artefacts including Sumarian tablets, pieces of the wall of Babylon and Roman marble statues. The Treaty of Kadesh from the 13th century BC is also housed here, as well as what was once believed to be the very well preserved sarcophagus of Alexander the Great. The Topkapi Palace (Topkapı Sarayı) is the imperial enclave of the Ottoman emperors for four centuries. It is lavishly decorated and houses some of the Prophet Mohammed’s belongings. 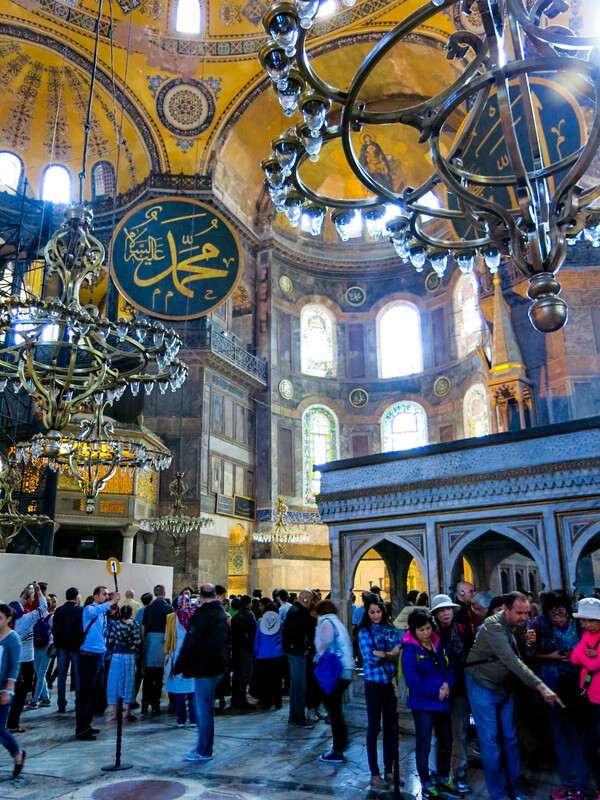 Traveller Tip: The Museum Pass İstanbul is a good way to visit Hagia Sophia Museum (25 TL), Topkapı Palace Museum (25 TL) and Harem Apartments (15 TL), İstanbul Archaeological Museums (10 TL), İstanbul Mosaic Museum (8 TL) and Museum of Turkish and İslamic Arts, and the Museum for the History of Science and Technology in Islam with one ticket and without having to queue. This ticket costs 85 TL and is valid for 72 hours (or 3 days), there are also discounts for other museums and shops. It is available in several hotels or at the entrance to any of the above museums. The Istanbul Spice Market was once the largest spice trading venue of the medieval world. Originally the Egyptian Bazaar, it has been used for the last 350 years as a market place for spices, medicinal herbs, incenses and oils. 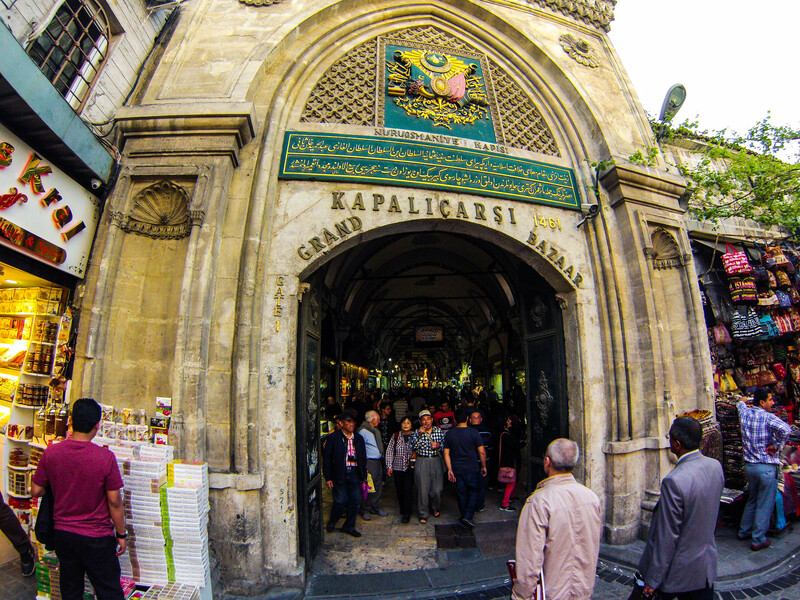 Some stores now emulate Grand Bazaar souvenir kiosks stocking scarfs and homewares. But you can still pick up full bodied spices from most stores. 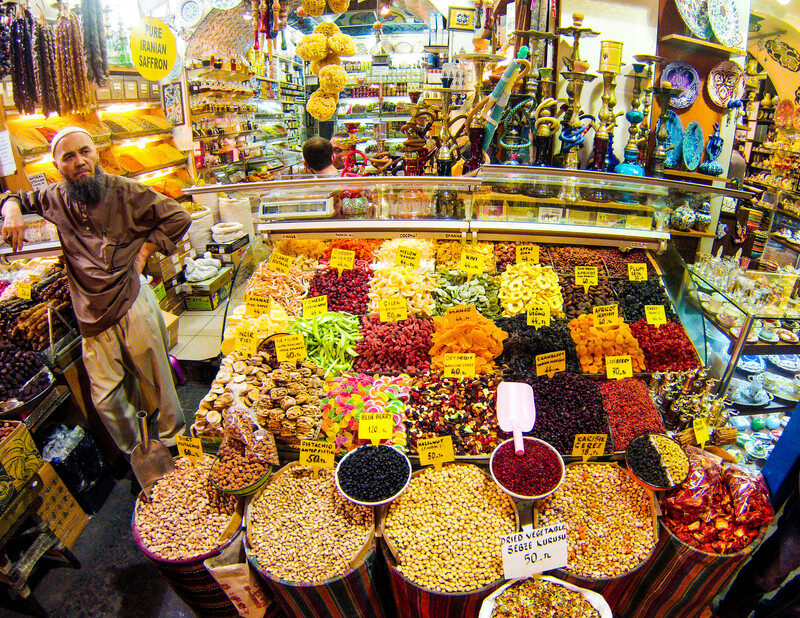 Check out the spices at the authentic Arifoğlu (#31). Other delicacies that you can pick up here are dried fruits and nuts from Malatya Pazari (#40 and #44), Turkish Delight, cheese and Turkish coffee. Özer (#82) is a Boudoir style shop offers hand-woven silk scarves and restored antique female clothes. Traveller Tip: When shopping at the Spice Market or Grand Bazaar, taste before you buy, buy from a reputable, high-turnover supplier and pay in Turkish Lira. A Turkish bath, or hamam, can be a daunting experience. There are many historical baths located around Istanbul, but one of the oldest and most elegant is Çemberlitaş Hamam, Çemberlitaş. Alternatively, you can also check out Çemberlitaş hamam located on Yerebatan Street close to the Grand Bazaar or Beylerbeyi hamam close located right next to Beylerbeyi mosque. One of the fanciest hamams in Istanbul is the Kılıç Ali Paşa Hamam, Tophane. There are several different services that you can pay for at a Turkish bath. Select the Traditional Style if you want the real experience. An attendant will wash, exfoliate and massage you for about 15 minutes. You are usually provided with sandals and a cloth to be tied around your waist for modesty. Women and men are admitted separately. Men will usually be completely naked under their wrap, while some women might want to keep on their underwear (often not their bra). You will get drenched, you will be scrubbed bare and you will be expected to tip the attendant 10 – 20% of the total amount. Istanbul has two airports: Atatürk International Airport (IST) (Atatürk Hava Limanı) about 23km west of the Old City of Istanbul, and Sabiha Gökçen International Airport (SAW) at Kurtköy on the Asian side of the city. Havataş airport buses run from Taksim Square to Atatürk International Airport and Sabiha Gökçen International Airport. The best way to get from Sabiha Gökçen to Atatürk Airport is to use the Havas Buses from Sabiha Gökçen-Taksim and Taksim-Atatürk Airport. A taxi from Atatürk Airport to Taksim Square may cost about 40 TL to 50 TL and take between 35 and 75 minutes, depending upon the exact location of your hotel, the weight of traffic at the time, and your driver. The taxi company, SS 127, clearly indicates the prices on its webpage to different locations in Istanbul. You can take the Metro from the Atatürk Airport terminal to Zeytinburnu, change to the Kabataş tram, ride that all the way to the terminus at Kabataş, then take the Füniküler up the hill to Taksim. IETT express city bus 96T departs Atatürk Airport and travels along the shore of the Sea of Marmara stopping at the Yenikapı Fast Ferry Terminal and AksaraySquare on its way to Taksim Square. A taxi from Sabiha Gökçen Airport to the historic Sultanahmet district will take between 60 and 90 minutes and cost around 85 TL depending on traffic, location and driver. A taxi to Taksim Square could take 60 to 75 minutes and cost around 75 TL. The taxi company, SS 127, clearly indicates the prices on its webpage to different locations in Istanbul. Public transport buses are the cheapest way to go to city centre, however you need to transfer to the ferry and tram and it can take a long time. IETT (Istanbul Public Transport Authority) has a bus line, E-10, which departs from Sabiha Gökçen Airport and stops in Kadiköy on the Asian Side. From Kadiköy, you can take the ferry to Eminönü in order to reach Sultanahmet. From Eminönü, you can take the T1 tram in the direction of Zeytinburnu and get off at the Sultanahmet stop. If you want to go to Taksim, take the ferry to Karaköy from Kadiköy. Then take the T-1 tram in the direction of Kabatas, get off at the last stop at Kabatas, and, finally, take the funicular to Taksim. The International Istanbul Bus Station (Uluslararası İstanbul Otogarı) operates intercity and international routes. Otogar (bus station) is in the western district of Esenler, just south of the expressway and about 10km west of Sultanahmet. The LRT service from Aksaray stops here (Otogar stop) on its way from the airport; you can catch this to Aksaray and then connect with a tram to Sultanahmet. Kamil Koç services most major cities throughout Turkey. Ulusoy runs twice-weekly buses to and from Greece, Germany and France, as well as services to most major cities in Turkey. Varan Turizm is a premium line with routes to major Turkish cities and to several points in Europe, including Athens. Trains from Europe terminate at Sirkeci Railway Station near Eminönü. Trains from the Asian side of Turkey, and from the east and south, terminate at Haydarpaşa Railway close to Kadıköy. The two train stations are connected by ferry, which is cheap and convenient. A taxi is expensive and slow. 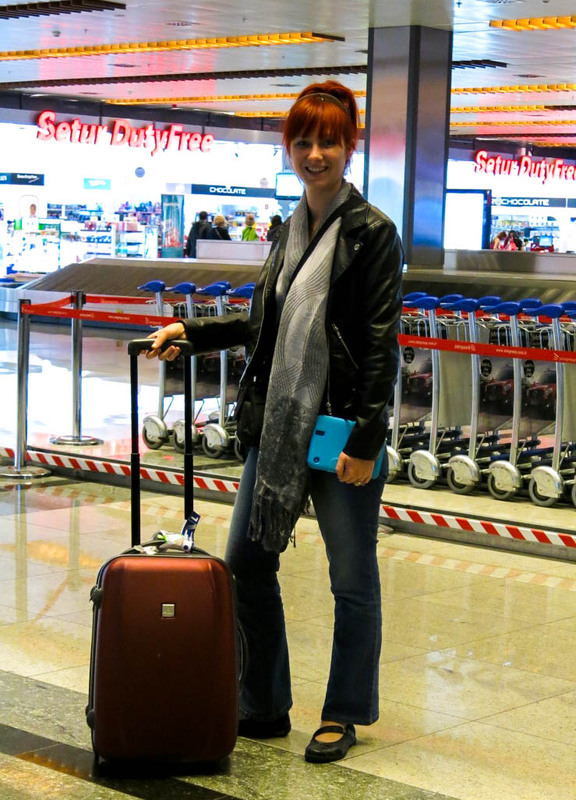 To get to and from Europe, daily overnight trains link Istanbul with Bucharest and Sofia. High-speed trains called YHT, Yüksek Hızlı Treni, operate on the Eskisehir to Ankara, Ankara-Konya & Eskisehir-Konya routes within Turkey. Most major stations have a computerised ticketing & reservation systems from which you can book tickets on the day or a short time in advance. Alternatively, the Turkish Railways (TCDD) website www.tcdd.gov.tr has an online booking facility in English.